Wyburn: December ALREADY? This has to have been the most manic and fast paced year ever! Wayne: Well it certainly has been for us anyway! 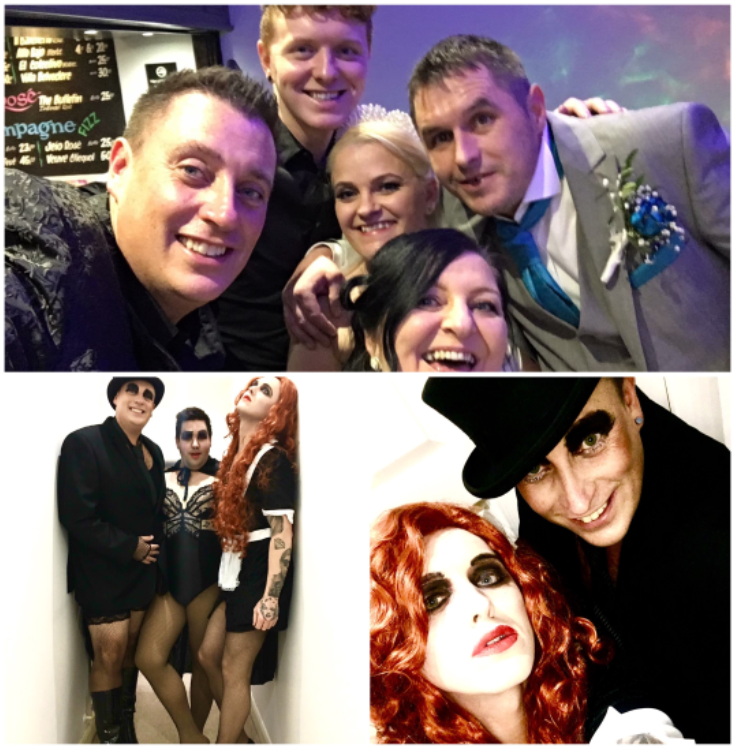 How incredible was the re launch of the Rainbow Casino? Red Carpet, free champagne, fabulous entertainment and a lovely chat with Welsh Rugby captain Sam Warburton! What more could you want? Wyburn: Sam was great, and awesome he remembered me from my art I did of him a while back! If I remember correctly you took full advantage of the champagne haha! Also another lovely person we met this month was Kelly Brook! We interviewed her at the event held by the Skechers store in Newport! How comfy are our trainers? Wayne: We have to mention our Halloween fundraiser in aid of Bullies Out, which was a great quiz and music evening at Face 11. We just missed last month`s deadline to mention it and it’s slightly odd saying it in December haha! OMG the Great Taste Awards this year were outstanding, celebrating all the amazing food and drink products produced here in Wales! Wyburn: You know I love my food! So good! On the topic of food, we also got to try Grey (inside The Hilton) this month, so delicious and great value too – the staff were so kind, we’ll 100% be going back there! Also Porro opened on Wellfield Road, beautiful venue and so great to see the street booming! We sampled the breakfast at 29 Park Place and Granny Macs on City Road too – both gorgeous hearty breakfasts well worth the visit. Wayne: You could talk about food all day couldn’t you Nath? 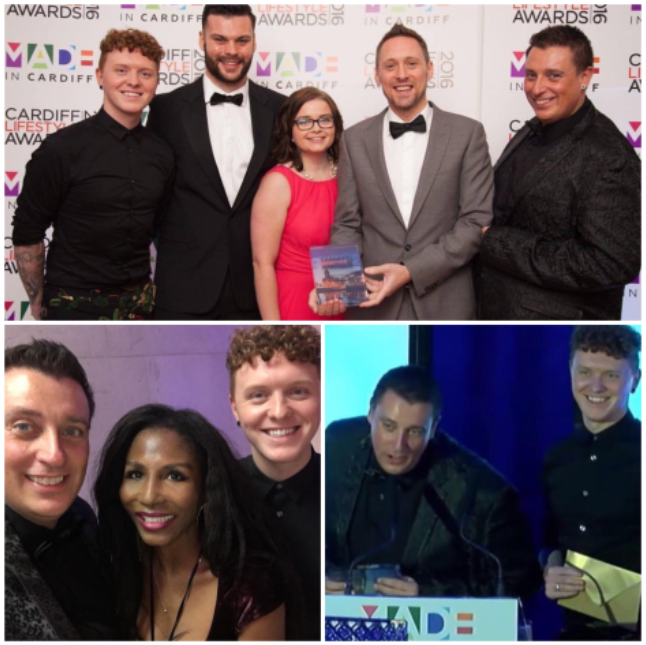 How epic were the Cardiff Lifestyle awards hosted by Made In Cardiff? We had the pleasure of announcing the winner of Best Fitness facility, how ironic! Well done to Pure Gym on their win! We had a great time chatting to 80s pop star Sinita at the event too, she’s a hoot! 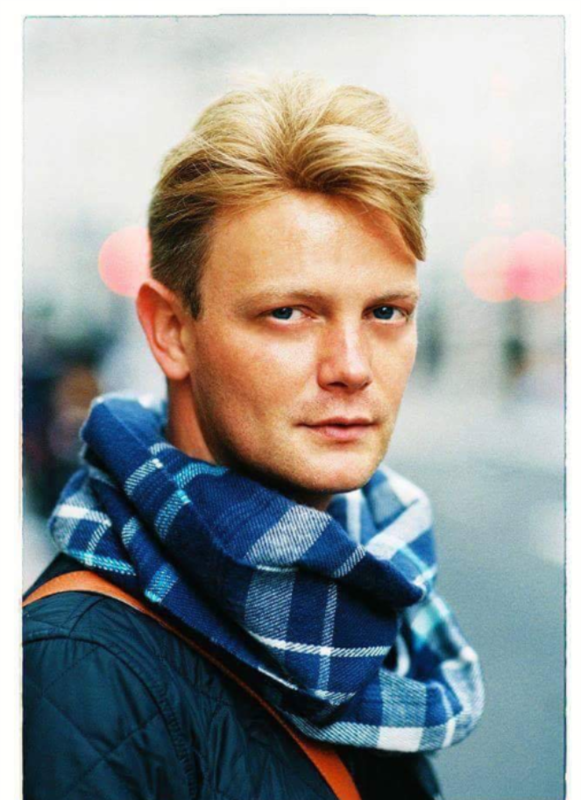 Wyburn: `So Macho` has been stuck in my head for weeks! We’ve seen some great shows this month. The South were at The Globe, we met Rebecca Ferguson at St David’s Hall (thanks for the red wine Bec) she was so genuine! Theatre wise we got to see two amazing shows, Rocky Horror is always a must and didn’t disappoint again, of course we were fully dressed up and dancing along to that! And also The Full Monty in the Millennium Centre was just brilliant, I didn’t expect it to be so funny! Wayne: I know, my cheeks (say nothing) were hurting! What a great cast too! My good friends Emma and Jamie got married this month, what a crazy reception that was! Congratulations guys!! Not to forget our Christmas Fete, sponsored by CPS Homes, in St Andrew’s Church on Wellfield Road! An incredible turn out, amazing craft fare, fab singers and our Santa’s ‘giving back’ gifts had a wonderful response. We encouraged children to bring gifts for the homeless instead of receiving them from Santa – I was overwhelmed by the turn out. Wyburn: I know, not one child asked why or asked for a gift in return, faith in humanity was at a high that day! I also had the honour of announcing John Nicholas as the NatWest Enterprise award winner at The Princes Trust Celebrate Success ceremony – always great to help those guys out! 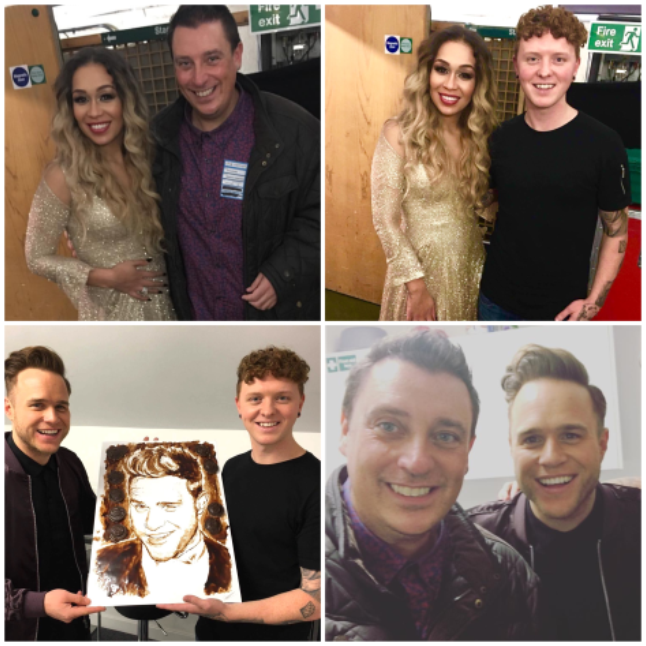 Oooooo and we got to meet Olly Murs! He was happy to say a few bits to camera for us, and loved his fun Jaffa Cake chocolate art I presented him with! Wayne: We can’t not mention our latest Carpool Karaoke with DAME SHIRLEY BASSEY!! Well not really… We had a fab time filming with the fabulous impersonator Rachael Roberts! What a dame she is! 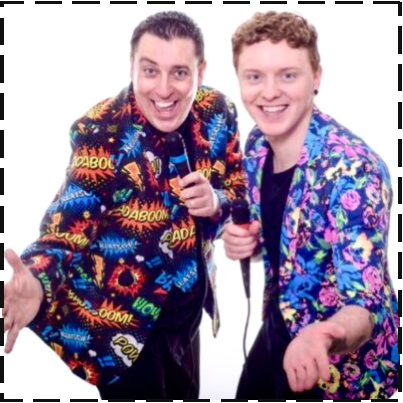 We belted out some of Bassey’s greatest hits whilst driving through Cardiff – it’s a great laugh, check it out on our Facebook page, along with all our other videos and interviews this month! Nath… Didn’t you interview someone special? Wyburn: AHHH yes! My number one, Anastacia!! I had a whole 15 mins chatting to her about her new Album, Strictly and her tour coming to St David’s Hall next June! Best perk of the job ever! Fave place to eat in Cardiff: The Plough in Whitchurch, great place to relax with Friends on a Sunday. Fave bar in Cardiff: Juno Lounge on Wellfield Road. Nice and quiet place to have a conversation with the BFF.